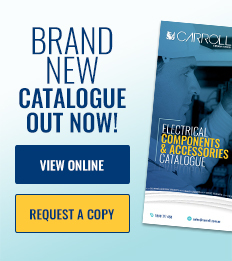 For over 35 years Carroll has focused on supplying premium electrical accessories and pre-printed wire identification solutions to a diverse range of market segments. Our product line is a complete program for terminating, connecting, bundling, protecting and identifying electrical circuits, supplied in accordance with the ISO 9001 quality standard. The Carroll development team is always looking at tomorrow’s needs, anticipating new product application requirements and partnering with quality manufacturers around the globe. Our ultimate goal is be preferred supplier to other quality organisations who share a progressive outlook. Carroll customers come from a diverse cross section of industry. Our products are reliably performing everyday in many stringent and hazardous environments including; power stations, rail and mass transit, aerospace, airports, mining, agricultural, trucks, buses, cars, food, smelters, refineries and petrochemical plants. The entire Carroll team share the common goal of delivering exceptional customer service. This is delivered by our professionals from customer service, sales, marketing, supply chain and a state- of-the-art order despatch process from both Sydney and Perth locations. Orders received before 4.30pm (Sydney time) are despatched same day, if the product is available in stock. Our pre-printed wire identification service will always be delivered with care, accuracy and speed.